Interface used by the validator to fetch missing certificates. Definition at line 39 of file certificate-fetcher.hpp. Definition at line 43 of file certificate-fetcher.hpp. Definition at line 33 of file certificate-fetcher.cpp. Assign certificate storage to check known certificate and to cache unverified ones. Definition at line 41 of file certificate-fetcher.cpp. If the requested certificate exists in the storage, then this method will immediately call continueValidation with the certification. If certificate is not available, the implementation-specific doFetch will be called to asynchronously fetch certificate. The successfully retrieved certificate will be automatically added to the unverified cache of the certificate storage. When the requested certificate is retrieved, continueValidation is called. Otherwise, the fetcher implementation call state->failed() with the appropriate error code and diagnostic message. Definition at line 47 of file certificate-fetcher.cpp. 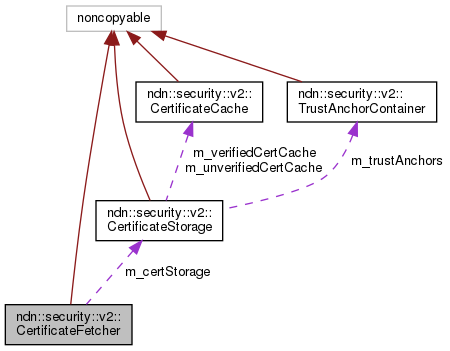 References ndn::security::v2::CertificateStorage::cacheUnverifiedCert(), ndn::security::v2::CertificateCache::find(), ndn::security::v2::CertificateStorage::getUnverifiedCertCache(), m_certStorage, and NDN_LOG_DEBUG_DEPTH. Definition at line 84 of file certificate-fetcher.hpp. Referenced by fetch(), setCertificateStorage(), and ndn::security::v2::CertificateBundleFetcher::setCertificateStorage().